The Ghanaian music industry is still crawling to reach its apex especially with Sarkodie wining the BET Best International Act (Africa) awards, VI.P featuring on Rapper 50cent’s prestigious blog alongside top musicians like Itz Tiffany, Samini, D-Black, Castro, and FOIKING BOYZ (One love Kubolor and Mensah). 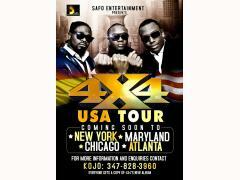 Another top music group who are yet to make history in the U.S.A is 4X4. This good news got to GhanaSuperStars .Com’s desk after we came across a poster circulating on the internet about their upcoming tour in the State. In a chat with the organizer by name, Isaac Tweneboah, who is also the C.E.O of Safo Entertainment located in (USA) Bronx, New York, he told GhanaSuperStars.Com that Safo Entertainment is a non-profit making organization founded to raise funds for the welfare of children through the arts and entertainment. 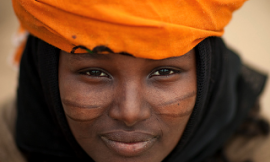 “Safo Entertainment is a New York based momentous events organization with two main focuses. First and foremost, our focal point is on the best entertainment production and best event promotion. Safo Entertainment decided to establish another branch, which is monitoring musicians, both tapped and untapped” – he added. He continued that as part of their objectives, they intend to develop Ghanaian culture in the USA and beyond through its events and that will begin with 4×4 live in New York for the first time. Isaac Tweneboah who has been a member of Hollywood Nightlife and continues to lead that life by helping upcoming and current Artistes with promotions and shows. 4X4 were chosen for many reasons. “They are marketable and have good songs; we believe they can easily help us to realize our goal during their tour” Isaac concluded. He heartened music fans to watch out for 4X4’s tour together with lots of surprises which will be announced exclusively soon on GhanaSuperStars.Com.